When designing with shaped beads, it’s difficult not to bead a flower, if just seems to come naturally. Floral motifs in jewelry are as old as jewelry itself and a steadfast go-to. 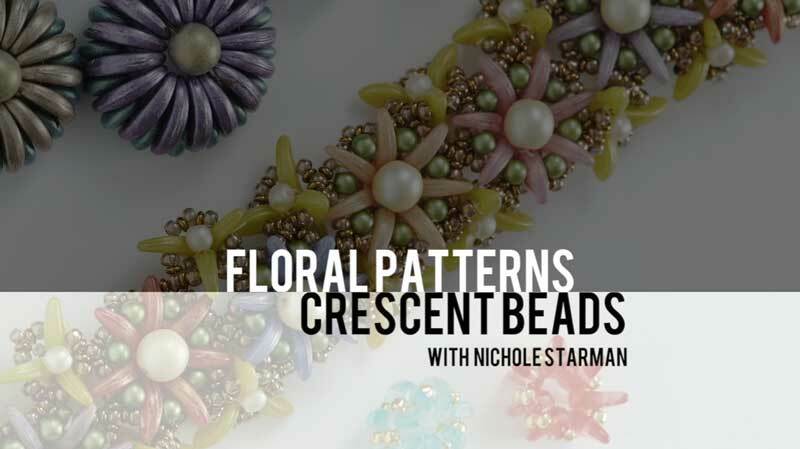 In Floral Patterns and Crescent Beads, Nichole Starman proves that when it comes to beadweaving and creating floral patterns, we need not resist! 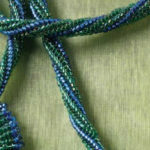 As the mind behind the CzechMates two-hole beading system, Nichole knows how to use a bead’s shape to her full advantage. Its soft arc and delicate points make the crescent bead a natural choice when creating floral shapes, with either the convex or concave side providing the texture. 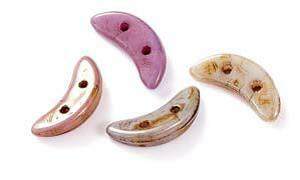 They can also be used to bezel a cabochon or create a sphere. With over 100 colors to choose from, whatever beadweaving design you can dream up, you can create it! Beading is, by its nature, an orderly activity. 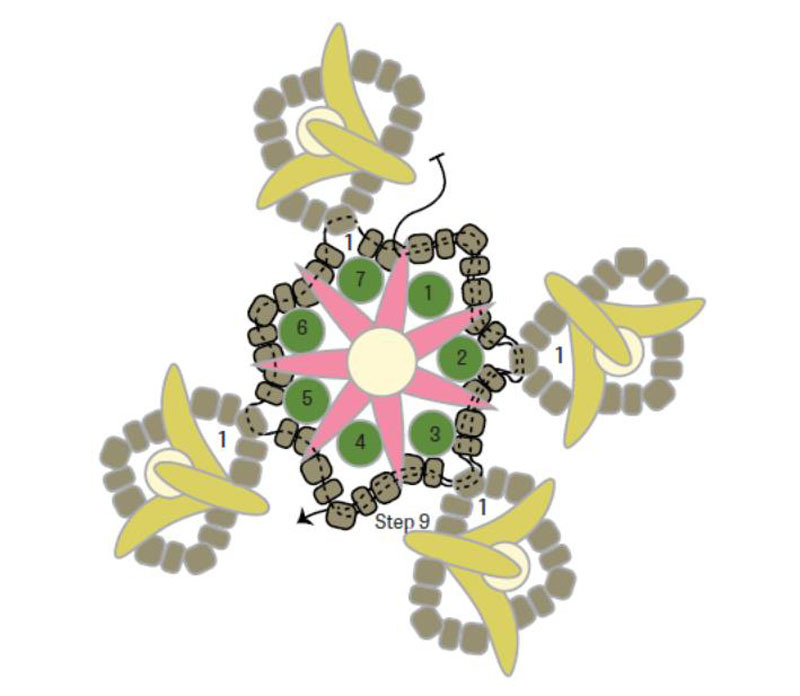 We all know that surge of right-brained satisfaction when a bead nestles into position. And for many, that is the appeal. In her new video, Nichole shows us how, as beaders and artists, we can embrace creative chaos while maintaining the order necessary to create a successful finished piece. The combination of symmetry and asymmetry in the Anemone Bracelet design is a perfect example of what Nichole calls “abstract symmetry.” She uses “the rule of threes” to accomplish a design that appears free-flowing and organic but also balanced and restrained. It reminds me of a grade school notebook doodle, with its carefree, sunny spirit. I particularly like how she adds “sprigs” to the edges of the bracelet. It is thoughtful details like these that distinguish Nichole’s work and continues to surprise us. 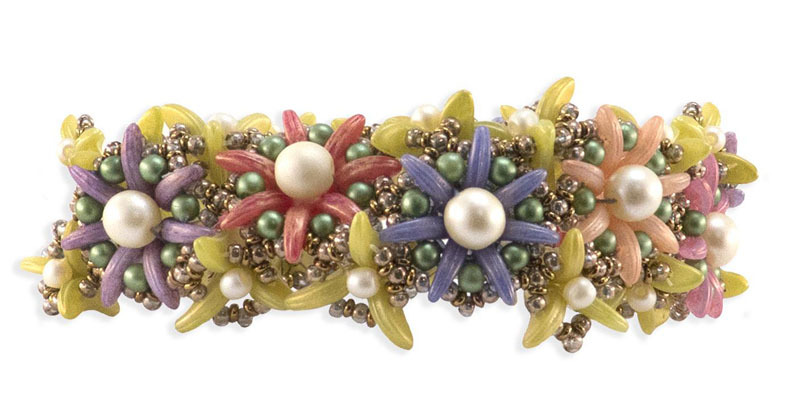 At first look, the Anemone Bracelet design appears impressively complex. The nature of the design and how it was created is not readily apparent, but it’s actually fairly simple. The “rule of threes” is most often applied to writing and oratory. It suggests that things that come in threes are more impactful and satisfying to a reader or audience. It’s only natural that this concept would also apply to how we view visual art and design. To create the bracelet, Nichole stitches each flower individually, then uses picots to connect them in sets of threes. If you’d like to try it out for yourself, the materials to make the Anemone Bracelet and Nichole’s video are available as kit. Or watch the video and try the design with colors of your choosing. Nichole and her team at Starman have exceptional instinct for color trends and we’re always impressed when they release a new line. One of their latest is the Pacifica collection, inspired by vintage California fruit crate advertisements. These colors would be charming in the Anemone Bracelet. Or make it in a darker colorway for an edgier look. 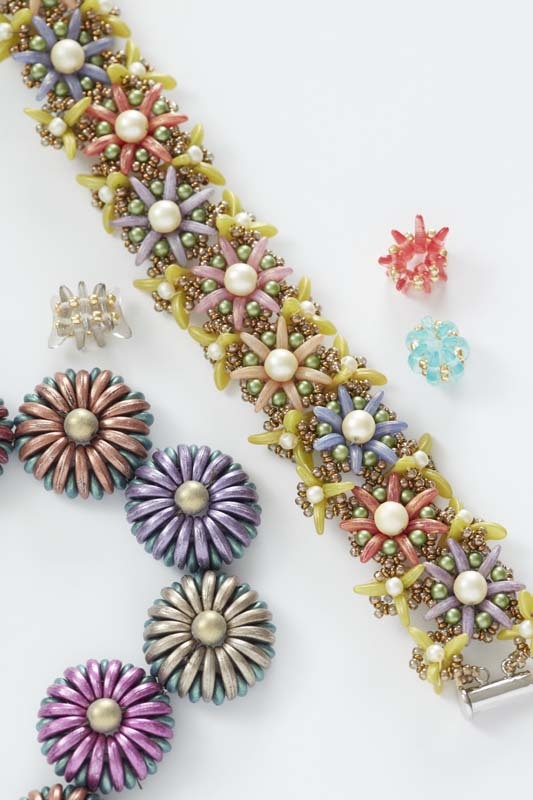 Floral Patterns and Crescent Beads with Nichole Starman and the Anemone Bracelet has inspired us, as beaders and designers, to push ourselves beyond the orderly and symmetrical, to imagine what we might do that would be different than what we’ve done before. And we’d love to share that experience with you. Dive into the two-hole shaped bead craze and learn from one of the best!